The last of the three stories in the Summer Fiction issue is “Above and Below” by Lauren Groff. (Groff has a novel coming out but I gather from the interview that this isn’t excerpted from it.) I want to say it’s the best of the three, but they’re all so different that I guess I won’t say that, and, despite all its great strengths, I thought it went on a little long and I’m a little unclear as to what it’s about. But the plot: a woman in graduate school who grew up quite poor (and has issues with her distracted mother), has broken up with her boyfriend and when she loses university funding her fragile finances crumble. She moves what few belongings she can in her old station wagon and hits the road—bound for where she doesn’t know. She finds various ways to survive. She showers in the gym of a beachside condo complex. She gets food from a church “soup kitchen.” She goes dumpster diving. When she finds a five dollar bill (how convenient!) she goes to a bar and lets herself get picked up by a guy and after he falls asleep she raids his refrigerator. When her car gets stripped, she’s even more homeless, but she stumbles upon a job cleaning nightclubs which lasts for a while until her boss, Euclid, has a stroke. She winds up in a tent city of homeless people watching the kids of a single mother who works in a fast food joint—until she gets fired and then arrested for prostitution. So she winds up back at the campus where she started and stumbles upon people scavenging discarded furniture from campus housing, and she hooks up with them, winding up in a Prairie House that is a “squat,” the kitchen of which she cleans, using the skills she acquired during her short-lived cleaning gig. >I found this story to be so beautiful I was sorry when it ended. I see it as a story about poverty and the fragile line between a normal life and being almost too poor to exist. The ending startled me and I found it abrupt, but in a good way because I felt a sense of relief that this episode in the character's life eventually ended and became something she could look back on from a safer place. But the point is made: many people have no safety net. I loved this story. >I liked “Above and Below” but I found the ending very abrupt. It felt to me like the author had said “Enough!” and just tacked the ending on. The story actually reminded me of “Wakefield” written by E.L. Doctorow. That was also a “journey” story, but I felt the “logic” of the journey made more sense. And the ending was brilliant! 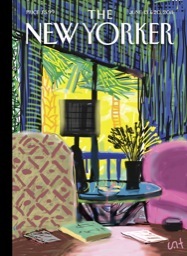 Of the three stories in the Summer Fiction Issue I enjoyed “Asleep in the Lord” the most. Although you point out that it isn’t actually a short story, but part of a novel. I couldn’t finish “Home” by George Saunders. The story is almost entirely dialogue – lots and lots of dialogue – and I tend to like my fiction with a mix of dialogue and exposition. But based on your review I may reconsider.